A properly diagnosed, designed, and custom fabricated mouthguard is essential to prevent contact sports injuries to the teeth. As a dental professional, it’s important to educate the parents and coaches about the limitations of stock and boil and bite mouthguards bought at sporting goods stores. They simply do not provide the optimum protection expected by the athlete. These poor fitting mouthguards are not customized for the athlete and cannot address personal differences that exist between different individuals. If everyone had the same dentition, played the same sport, played the same position at the same level of competition, were the same age and same size mouth, had the same number and shape of teeth, then prescribing a standard mouthguard would be simple. However, everyone’s mouth is different. This is the precise reason why buying a mouthguard from Amazon or a sporting goods store is a bad idea. For example, athletes with braces require a specially designed mouthguard to allow for orthodontic movement without compromising on injury prevention and fit. This can only be achieved through a custom-made mouthguard that will address the athlete’s specific situation. The National Youth Sports Foundation for the Prevention of Athletic Injuries, Inc. reports dental injuries are the most common type or orofacial injury sustained during participation in sports. When a tooth is knocked out and not properly treated, the athlete may face dental costs of $10,000 - $15,000 per tooth. Not to mention hours in the dentist's chair, and the possible development of other dental problems such as bone loss. A properly fitted mouthguard must be protective, comfortable, resilient, tear resistant, odorless, tasteless, not bulky, cause minimal interference to speaking and breathing, have excellent retention, fit and sufficient thickness to prevent injury. The stock mouthguards available at most sporting goods stores and purchased online do not provide any of these benefits. They come in standard sizes and are the least protective. You can buy an athletic mouthguard on Amazon anywhere from $1-$25. Many of these are ready to be used without any additional preparation or modification. Simply remove from the package and place in the mouth. Store bought mouthguards are bulky, lack any retention and are held in place by constantly biting down on them. This significantly interferes with both speech and breathing. This type of mouthguard is often altered by cutting it in an attempt to make it more comfortable. These alterations further reduce the protective properties of the store bought mouthguard and often result in a worse fit. A stock mouthguard is the least acceptable and least protective. The dental literature advises against wearing these type of mouthguards due to their lack of retention and protective properties. As sports dentists and health professionals interested in injury prevention, we do not recommend this type of mouthguard to our patients and athletic teams. Custom made mouthguards are fabricated by a dentist on a mold of the athlete’s teeth. Custom mouthguards provide the dentist and athlete with the ability to address important issues in the fitting of the mouthguard and assure it’s designed for the particular sport being played. The age of the athlete and the possibility of providing space for erupting teeth should be addressed. The design of the mouthguard should be appropriate for the level of competition being played. Does the patient have any history of previous dental injury or concussion, thus needing additional protection in any specific area? Is the athlete undergoing orthodontic treatment? Does the athlete present with cavities and/or missing teeth? Is the athlete being treated by a dentist or helped by an athletic trainer or sporting goods sales person not trained in dental issues? Custom made mouthguards are designed by a dentist and are the most satisfactory of all types of mouthguards. They fulfill all the criteria for adaptation, retention, comfort, and stability of the material. They interfere the least with speaking and studies have shown that a custom-made mouthguard has virtually no effect on breathing. The best type of custom-made mouthguard is the pressure laminated mouthguard. The pressure laminated mouthguard is made on a stone cast of the athlete’s mouth. 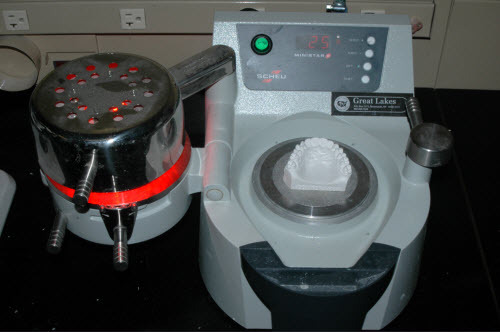 A thermoplastic mouthguard material is adapted over the cast using a specialized heated and pressurized vacuum machine. This allows for proper adaptation of the teeth and gums and allows for a uniform thickness of the material across all the teeth and supporting tissues. This customized fit with proper material thickness is what makes the difference between a store bought and a custom-made mouthguard. Our custom-made mouth guards provide precise adaptation and minimal deformation even after when worn for a period of time. The combination of the high heat and pressure used in the construction of the laminated mouthguard means that the mouthguard material has minimal elastic memory and holds its shape. We also have the ability to thicken any area needed as well as place any inserts needed for additional protection. Schedule a Visit to our Scottsdale Practice Today! Our mouth guards are made from a lamination process incorporating two or more sheets of a 3mm EVA (ethylene vinyl acetate) copolymer. The mouthguard is made on a cast of the athlete’s mouth creating a custom fit mouthguard with a minimum of 3 - 4mm of occlusal material thickness. This means it is Mom approved! 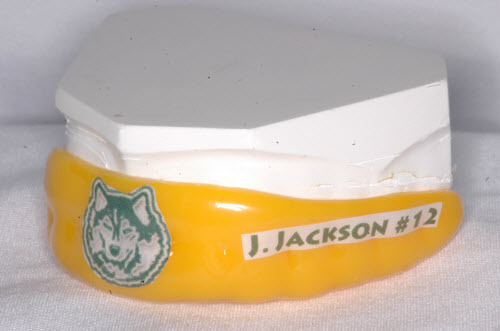 We can customize the mouthguard with the school colors, team mascot or logo and the athlete’s name and jersey number. The process takes two short visits. The first visit is to take a mold of the athlete’s teeth. The second visit is to customize the bite and assure a perfect fit.